Evernote for Mac 7.9 is now available for download. You can get it by updating your app or click here﻿. If you copied something from Evernote to another editor, all the line and paragraph breaks you placed so lovingly would just disappear. Since our parents taught us to play well with others, we fixed that. Printing a note with tables is fun, right? (OK, maybe that’s just us—we’re kind of geeky). It’s not fun when the table borders don’t print. We thought so too, so we fixed it. This copy/paste situation is killing me. I'm now looking at alternatives and I've been a long time user for years (paying premium user). I hope I don't have to switch. Adding the CR is crazy bad. Simple things like this need to work flawlessly. Separately, I see all kinds of weirdness copying/pasting b/w other Mac OSX apps like Outlook/Word. Really wish Evernote would just "work" right and not ***** with formatting so much. I really don't care about other features but need the core functionality to work properly. Another known issue in this version is copying text from Evernote and pasting into certain other applications may introduce an extra carriage return. "Fixed line and paragraph breaks no longer disappear on external paste / table borders now print"
Any idea when the carriage return issue might be fixed? Surely it's not a difficult issue to track down in the code and you could issue a dot release to address this quite quickly. @Jay-Bob, @Nick L. - PLEASE update us on this issue - this is so painful for people saving code snippets and pasting them into command line (causing something to execute). Why is it still not fixed?? As a developer myself, I can't imagine that this is a hard bug to track down, as noted by others on this thread. Another related feature request is to stop auto-correct in Code Blocks. I've been a paying premium user for 6.5 years and I'm so disappointed by these. Scrolling notes with images, texts and attachments is choppy. 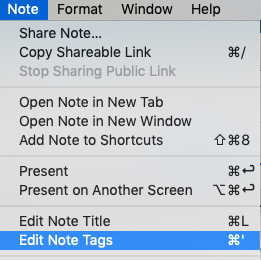 After upgrading to version 7.9 in Mac (Mojave) I can't see the same notes on the web as in the Mac app. In the Mac version I see only my last note since yesterday. All notes are only shown on the web version tough I'm using the same username in both. Do you see all your notes if you go to their respective notebooks? What kind of note list do you use? (card view, snippet view, list view, etc) ? Yes I can see all notes in their respective notebooks with their tags. I use mostly card view but I get same results when using any other view. Thank you. I DM'd you requesting some information. Wondering why there isn't a "check for updates" built into the application? That would alleviate needless hunting around for information regarding software updates. Updates for the app store version are handled by the app store.